Become a master botanist as you learn how each plant grows. Some need room to branch out and can be choked before they've matured, while others have growth patterns that harmonize well with certain species. Drag a seed to the board and click 'Go' to start growing. Plants stop growing when they run into another plant, a rock, or a fence post. 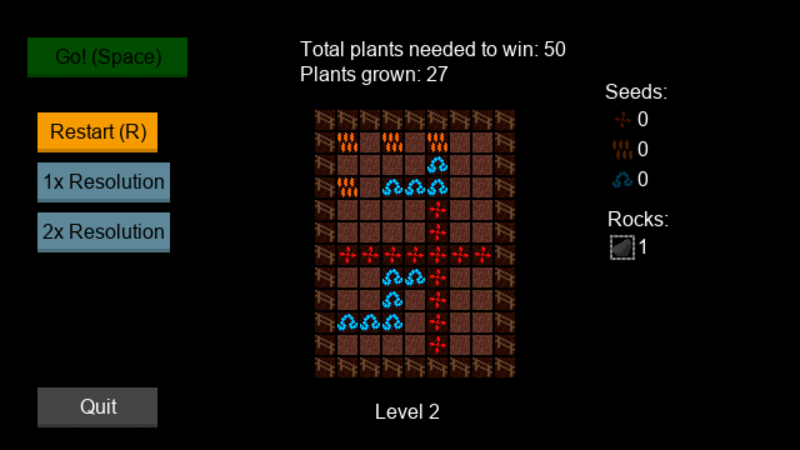 Grow enough plants to win all 5 levels! This was a really nice puzzle game. You really have to use spacial awareness and memory to calculate how things will grow. I'd love to see this with added levels and plant types. This has a really strong foundation. The theme felt more 'shapes' than 'colours' here, but I enjoyed the playthrough regardless. Great submission! Hey I thought this was a level game, though felt the color aspect was side was a bit thin. The retro pixel art was great and consistent. There was no sounds which was a shame, I think had you put in sounds for each Tick of plant movement that could have been cool. I managed to beat quite a few levels and then I got stuck on some where I wasn't even close,it felt the difficulty curve was a bit inconsistent. This game is really good! There is some sort of issue where progressing to the next level by click (after the first time) doesn't work, so it was useful to be able to switch the level with the arrow keys. I especially liked the resolution-change feature. If you planned to work on this game after the jam, I would suggest you add a way to view where you put the plants last time, when you restart. Overall, good difficulty, fitting art, and very creative puzzles! Definitely an interesting concept, and I appreciate that the plant sprites match the pattern they grow. However I seem to get stuck at level 2, and it continues to say "Level 0 Complete!. Click to continue." Clicking simply restarts the level. Plant exotic seeds and grow them to their full potential! Each one grows in its own way, so plan(t) carefully to win.